Death by a thousand cuts. That's how we may remember New York City in 2014. The New York Public Library decided to travel back in time, past the Enlightenment and squarely into the Dark Ages with a plan to disembowel the main branch, removing seven stories of stacks and off-shoring those pesky three million books. Then there was The Frick. Change is good but when you have the perfect small museum, please, please think twice about doing anything to it, such as building a six-story addition. For April Fool's Day last year, we wrote that The Frick Collection was selling out to The Container Store, the humor being (and not everyone found it funny) that you would take something so exquisite and turn it into a collection of empty vessels. Don't put your paws on The Frick. Leave. It. Alone. Lincoln Center got in on the act by putting the naming rights for Avery Fisher Hall up for sale to pay for a renovation. New York will go on, but it's unseemly as hell. Our hope is that Sheldon Adelson ponies up the most money; let the Sheldon Adelson Hall (opposite the David H. Koch Theater) be a cautionary tale for future New Yorkers about the perils of selling your civic pride. They plan an "administrative action" to take 96 buildings and sites around the five boroughs that have been considered for landmarking (and historic districting) on which no action has yet been taken, and simply clear them from the books. It's wrong because it's being done in stealth. The LPC needs to hold a truly open hearing and consider the building and sites. Yes, some have been 'calendared' for over 20 years, and it's not a problem if they remain calendared. Uncalendared, they become endangered. The LPC notes that "this proposed action is without reference to merit." So why do it? The action would be a boon to developers but a bane to the rest of us. Is every site worth landmarking? Unlikely. But take a look at the list. Union Square Park? 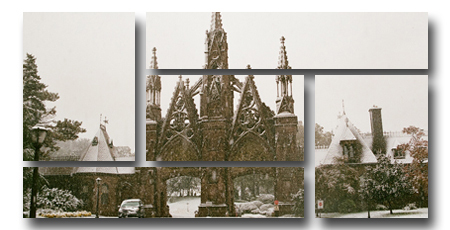 Green-Wood Cemetery? The new LPC chair, Meenakshi Srinivasan, has some things to learn about transparency and accountability. The meeting at which the decalendaring will be addressed takes place on 12/9, at 1 Centre Street, 9th floor. It starts at 9:30am, but there will be 18 Certificates of Appropriateness considered before the wholesale unloading begins. Email Ms. Srinivasan at comments@lpc.nyc.gov or voice your objection to this chicanery by calling the LPC main number at 212.669.7700. We can always rename a music hall but we can't unraze a building.